BRIC countries are no longer developing contries, they should rather be called Growth 8, maintains Goldman Sachs Assets head Jim O’Neill. Analysts’ forecasts for the Western economy in 2012 are not comforting: the threat of recession in Europe and uncertain prospects for the United States. Against this background the fairly high rate of GDP growth in developing countries suggests that their share in the world economy will increase faster than expected. The head of Goldman Sachs Assets, Jim O’Neill, credited with coming up with the term BRIC, believes that the traditional distinction between developed and developing countries is outdated. 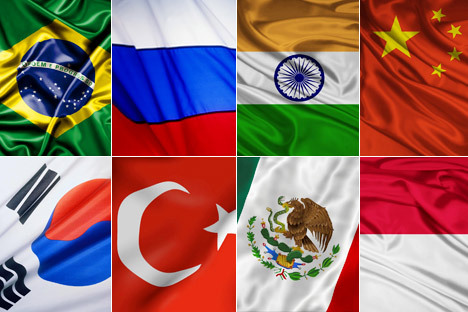 China, Russia, India, Brazil, Turkey, Mexico, South Korea and Indonesia are no longer developing countries. He suggests that these markets, which cannot yet be called industrial powers, be called Growth 8. He predicts that the combined GDP of these eight countries will account for about a third of the world economy by 2020. The G7 countries – Germany, the United States, Japan, Great Britain, Canada, France and Italy – will account for just over 40%. Growth 8, of course, will not seek to become a formal organisation. It is just the recognition of the fact that more and more developing countries are catching up on the Western economies in a number of areas. One can mention at least two financial and economic indicators where they are ahead of the G7. First, the rate of GDP growth: JP Morgan predicts that these developing countries will grow by 4.6% in 2012 whereas Europe is in for a recession and the United States will grow by 1.8% . “The current global economic slowdown may affect the growth of these emerging countries, but only in the short term. We have seen something similar during the previous crisis,” Julian Jessop, the chief economist of Capital Economics told RBC Daily. Secondly, developing countries boast a low level of national debt. In 2011 the industrialised countries owed 104% of their GDP while the emerging countries just 36%, and the latter are the main creditors of the former, the German Handelsblatt writes. Many analysts point to the potential of the stock markets in developing countries. “They are still growing at three times the rate of the industrialised states, which will sooner or later make a difference to the incomes and share prices of the local companies, notes Mark Mobius, stock market manager with Franklin Templeton Investments. He points out that in the eight out of the last ten years emerging markets registered better results than developed ones, and there is no reason why that trend should change. Even so, those who wish to invest in Growth 8 have to bear in mind the serious risks, Handelsblatt warns. The chief ones among them are inflation and geopolitical problems. Many emerging countries, in the first place China, face the danger of overheated economy. Thus, China has to control growth to curb inflation and prevent possible bubbles (in the real estate and stock markets). Political upheavals, such as armed conflicts and change of government, may also have a serious impact on the Growth 8 stock market and GDP growth rate. The story is translated. You can read Russian text in RBC daily.